Quinnipiac’s Nicole Kosta skates in the first period of Saturday’s game vs. RPI. Quinnipiac’s Nicole Kosta skates in the second period of Saturday’s game vs. RPI. 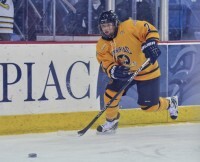 Quinnipiac’s Jordan Elkins takes a shot in the second period Saturday vs. RPI. Quinnipiac’s Breann Frykas scores a goal in the second period vs. RPI on Saturday. Quinnipiac’s Breann Frykas celebrates after she scores a goal vs. RPI on Saturday. Quinnipiac players celebrate after Breann Frykas scores a goal in Saturday’s game vs. RPI. 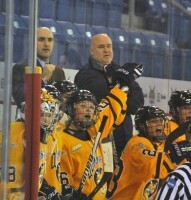 Quinnipiac’s bench looks on in the second period of Saturday’s game vs. RPI. Quinnipiac’s Kelly Babstock scores a goal in the second period of Saturday’s game vs. RPI. 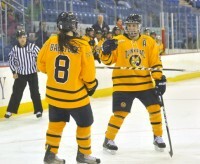 Quinnipiac’s Bethany Dymarczyk celebrates with Kelly Babstock after a goal in Saturday’s game vs. RPI. 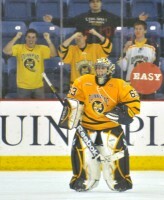 Quinnipiac goalie Victoria Vigilanti reacts after a Bobcat goal in the second period of Saturday’s game vs. RPI. 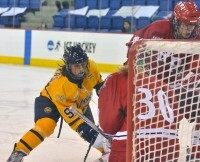 Quinnipiac’s Brittany Lyons controls the puck in the second period of Saturday’s game vs. RPI. Quinnipiac’s Kristen Eklund skates in the third period of Saturday’s game vs. RPI. Quinnipiac’s Kelly Babstock hits an RPI player in the third period of Saturday’s game. Quinnipiac’s Kelly Babstock scores an empty-net goal in the third period of Saturday’s game vs. RPI, her third of the game.